In order to have a black bloc, you need to have a group of people dressed head-to-toe in black, including masks, or who are at least doing something as close to that as possible. If you don’t have that, you don’t have a black bloc. The black bloc is a tactic. A tactic is a tool that is used to achieve certain ends. As a tactic, the black bloc works to anonymize its participants. In an age when facial recognition technology is improving everyday and police departments regularly ask the cooperative public to help them identify participants in riots, a black bloc can be used to conceal the identity of those who break the law in heavily surveilled public spaces, as with almost any demonstration in downtown Montréal. Before we really get into why people use black bloc tactics, it may be useful to explain why people choose to break the law during demonstrations. Many people consider economic disruption, property destruction, and/or physical resistance to police violence as legitimate and necessary components of a revolutionary strategy, and this is often coupled with the idea that keeping people out of the courts and the prison system as much as possible is a good thing. The black bloc, then, represents a sensible way to do certain kinds of things and (oftentimes) get away with it. In recent years, the government has repeatedly tried to pass a law that would make it illegal to wear masks during demonstrations for any reason, and it’s already the case that people repeatedly get arrested at demonstrations for simply being in the wrong place at the wrong time. It’s actually difficult sometimes to discern the difference between legal and illegal tactics. 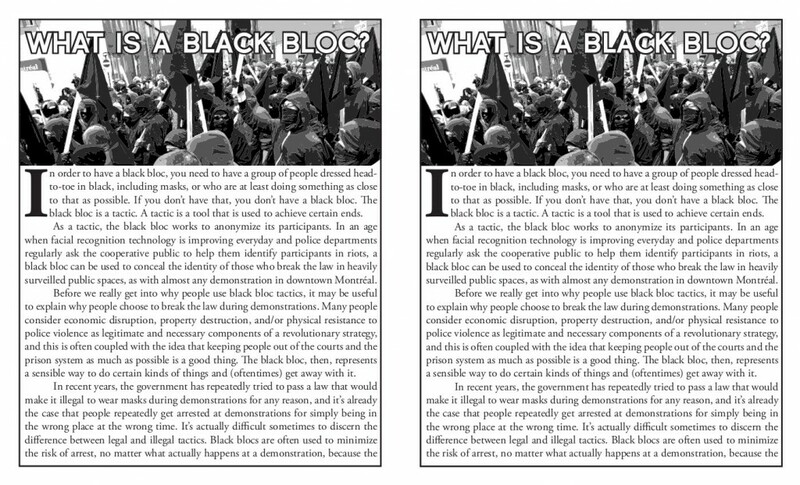 Black blocs are often used to minimize the risk of arrest, no matter what actually happens at a demonstration, because the line between what is legal and illegal is never something that demonstrators in the streets get to determine; it is, in general, a tool of the state to repress us and delegitimize our struggles. There are people who use black bloc tactics as a way to stay anonymous in order to commit illegal acts during a demonstration, but it’s important to note that folks who show to demos wearing all black may do so for a variety of reasons, and not necessarily because they intend to do anything in particular. Black blocs can be good for promoting a sense of solidarity and complicity amongst participants. They can be good for demonstrating a willingness to engage in militant action if it becomes necessary, as on February 12, 2010, during the Olympic Games in Vancouver; a contingent of Native warriors and black bloc participants were prepared to physically defend a march if the VPD attacked. Black blocs can engage in offensive action, such as when they attack particular targets, but they also frequently engage in defensive action. The first documented use of the tactic comes from Germany in the 1980s, where it was used by squatters to help defend their homes from eviction by the state. Since black blocs can be used to demonstrate a willingness to engage in militant action, they are sometimes used outside the context of a demonstration in the streets. In Atlanta in late 2011, when a woman was being constantly harassed at home and her place of work by her abusive ex-partner, she showed up at his house with a black bloc in tow to announce there would be consequences if his behaviour continued. The tactic is used, essentially, because it makes it difficult for police to identify which actions were carried out by which specific people during a demonstration. Even if people are caught by police or media cameras in the act of taking off their clothing, it is frequently the case that the only thing that can be proven against them in court is that they participated in a demonstration wearing that kind of clothing – not that they committed any specific illegal act. All this to say that a black bloc has practical as well as symbolic purposes and the decision to employ this tactic must be based on the specific circumstances of a situation. To be clear: there is no such thing as the black bloc, nor are there black bloc anarchists or anything else like that. Such categorizations mistake tactics for ideology – or, even more ludicrously, an organization of professional rioters.